Principal occupation Tin, iron and zinc plate worker and later a wheelwright and storekeeper in Willunga. Place of decease At his residence at 19 Aldinga Road in Willunga. Born in 1815 at Woolwich St. Mary Magdalene, Kent in England, Alfred claimed to have joined the Royal Navy in 1836. Alfred Hopkins, aged 27 years, and his wife Elizabeth arrived in Victoria on board the ship Thetis on 17 Feb 1842. Alfred was a tin, iron and zinc plate worker in the 1840s and he developed that business into a more general hardware/grocery operating in Yarra Street, Corio that he then sold in 1851. He may have returned to England in the early 1850s but in 1855 he was in Auburn, SA. He was in Adelaide by 1856 and by 1857 he was operating a shop at 73 Rundle Street, Adelaide, which he sold at auction in Nov 1858 and “moved to the country”. William Thomas (1841-) died as an infant. Alfred William (1844-1858) d. at Stepney, SA. Samuel (1846-1899) m. Rhoda Heath on 2 Nov 1866 in Willunga. Tinsmith in Willunga & Plumber at Queenstown. d. at Queenstown near Port Adelaide. Josiah (1848-1920) b. at Geelong. m. Ellen Cornock on 31 May 1871 at McLaren Vale. Machinist in McLaren Vale. Joseph (1850-1947) b. at Geelong. m. Eliza Prentice Hawkes on 7 May 1868. Coach-builder in McLaren Vale. Elizabeth (1855-1933) b. at Auburn, SA. m. Charles Lipson (1854-1945) in Feb 1879. 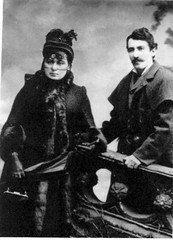 Amelia Rosetta (1858-1915) m. Charles Jacob Foster in Dec 1880 at Willunga. By Feb 1862 Alfred, his wife Elizabeth and their children had moved to Willunga as he was listed as an executor for the estate of David Oliver. From about 1864 they ran Hopkins’s store at 19 Aldinga Road and in June 1866 Alfred purchased the land at 19 Aldinga Road from James Ball Williams, quarryman of Willunga. Alfred was a wheelwright and storekeeper and played an active role in the Willunga community. He was a Wesleyan Methodist. Alfred Hopkins, aged 64 years, died of acute bronchitis at his residence on 18 Dec 1878 and he was buried in the Wesleyan Methodist (Uniting) Cemetery at Willunga. His widow Elizabeth (nee Fabling) continued to live in Willunga until her death, aged 92 years, in 1911. Do you remember Hopkins, Alfred ? Then Join up and add your memory here.